The Paralympic flames will be created on the summit of the highest peaks of the four home nations, London 2012 has announced. Groups of young disabled and non-disabled Scouts will get the honour of striking the fire-starting rods that will spark the flames. The national flames will be struck at the peaks of Scafell Pike in England, Snowdon in Wales, Ben Nevis in Scotland and Northern Ireland's Slieve Donard on August 22. The flames will rest at Paralympic celebrations in London, Belfast, Edinburgh and Cardiff before heading to Stoke Mandeville, the spiritual home of the Paralympic movement, where they will be united during a special ceremony on August 28. 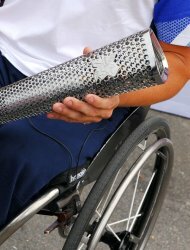 This will create the London 2012 Paralympic Flame which will then be carried on a 24-hour relay to the opening of the Paralympic Games at the Olympic Stadium. It will be carried 92 miles by 580 torchbearers working in teams of five from Stoke Mandeville to the Olympic Stadium. London 2012 chairman Lord Coe said: "We have created a unique identity for the Paralympic Torch Relay which will be a celebration of courage, determination, inspiration and equality that every Paralympian represents. "By creating the four flames through human endeavour at the four highest peaks in the UK we will ensure that the spirit of each home nation is represented in the Paralympic Flame. "Today we invite people to show their support for the Paralympic Torch Relay, whether it's taking lanterns along to a flame festival or celebration, supporting a torchbearer or getting together to line the route of the 24-hour relay and help us lead the way to the Paralympic Games." The Beatles' Abbey Road crossing, Lord's Cricket Ground, Piccadilly Circus and Tower Bridge are some of the landmarks that will be visited by the flame. Before then, each of the four capital cities will put on events to get people involved in the torch relay. The English Flame will be used to light the ceremonial cauldron in Trafalgar Square on August 24. The Northern Irish Flame will light the ceremonial cauldron outside Stormont on August 25. A festival including a lantern procession outside City Hall will also be held. A ceremonial cauldron on The Mound in Edinburgh will be lit by the flame in Scotland on August 26 and there will be a festival including a lantern procession at Meadowbank Sports Centre. A ceremonial cauldron lighting for the Welsh will take place outside Cardiff's City Hall on August 27.